So I received one of these little bad boys in the mail yesterday (Whoo Hooo! Thanks again, Josh!) when I got home from work so I got to work checking it out and seeing what was what. This is the first marker I’d gotten in over 3 years, so forgive me if some of my comparisons sound a bit dated in this review, but I’ll try to be as fair as possible. The batteries in my point and shoot are dead right now, so I’ll just “steal” the pictures from Tim’s thread (found here http://www.spyder.tv/forums/showthread.php?t=21579) and his review of the pistol. I'll add my pictures later... Just for the record, I got the “Diamond Black” kit. The packaging was pretty decent, packed in Styrofoam and a fairly sturdy box. It came with the gun itself, one magazine, a fairly detailed instruction book, one of those cheapy miniature pull through squeegees, an orange bbd (barrel blocking device), two 12 gram cartridges of Co2, a bag of spare parts and a jar of 100 .43 caliber paintballs. I was pretty impressed with the parts bag – since when do companies include such a detailed kit? Like I said, I have been out of the game for a while so maybe that’s what’s new these days. It came with orings of different sizes, allen wrenches, metal parts that I had no idea what they were for, extra detents, a microfiber cloth for the squeegee, a warning card, ect. *Comment on the paintballs that come with it. Holy balls, those things are small! In Tim’s pictures, I actually thought they were a little bigger, but I’d say these things are much smaller. In fact, my daughter said the one thing that actually covers them – “Oh, they’re cute!” Hahaha! According to the manual, you can only use Kingman .43 caliber paintballs with it. I don’t know the cost of them, so I can’t comment on that, but it appears that Kingman has once again taken over a particular niche within the market – good for them! All the paint was packed in tightly, but it was all very round. From the little research I’ve done, they are brittle enough to break when dropped about waist high. That’s good stuff. But then, I haven’t shot it yet, so we’ll see. So I pulled out the gun and the first thing I noticed was its size and weight. It’s a bit larger than I expected, but smaller than the Psychoballistic’s Delta I had used several years back (remember those big mamba jambas?) It’s also much smaller than the PT’s I’ve used in the past. However, for a guy with pretty small hands, the grip was rather large. That was a bit of an issue to me. In fact, my 15, nearly 16, year old daughter could barely get her hands around it comfortably. My first thought was that maybe if the grip had a larger, raised thumb rest on each side, that possibly could make it more comfortable. I don’t know though. But, to get the magazine and the Co2 cartridges in, the grip needed to be a bit larger – there doesn’t seem to be a lot Kingman could have shaved off. Also, I seem to remember that ALL Kingman grips were pretty big, so it’s pretty much moot. Size aside, it was relatively light. The way I understand it, the Eraser (the Chaser’s big brother) is all aluminum and as such a bit larger and heavier. The slide and frame of the Chaser is made of high impact poly, with the body and other parts being aluminum. In my mind, this is not a problem in the least. It doesn’t feel cheap and being smaller, shouldn’t have any issues with breakage whatsoever. In my mind, I would prefer this for a handgun rather than the possibly bulkier and heavier Eraser. So, definitely a plus 1 for this gun! The pistol has a nice rubber grip that doesn’t gap anywhere on the grip frame at all. However, the grip frame itself doesn’t sit entirely flush with the body of the gun – when held up, I could see light between the two. Since the only issue I could see there is possible sear to hammer problems and the occasional cleaning issue, I don’t see any real worries here. It’s been many years, but back in the day, Kingman had tolerance issues with their markers, and maybe it still goes for today. But, like I said, no real worries here. The trigger has an incredibly easy pull on it – not the definitive pull you had to make on the old markers and pistols. I really liked it on this gun. So give it another plus for that. The magazine is really cool. 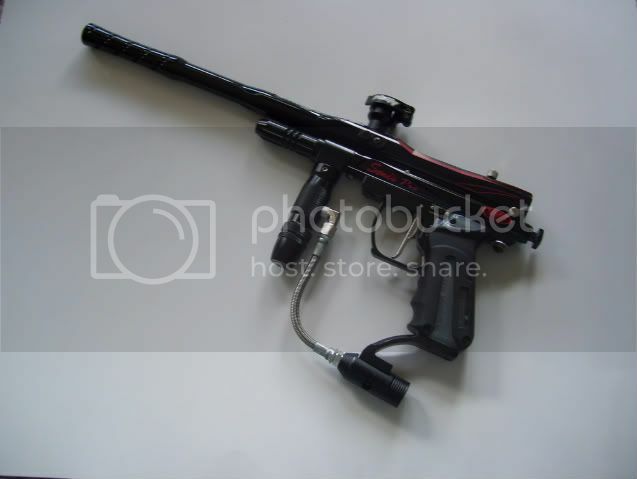 Back before I quit playing, there was only one company making a clip for a paintball marker and at the time it really wasn’t that great. Now, I see that this isn’t that uncommon anymore. The Chaser clip slides in and out easily, has no wiggle in the slot and loads relatively easy. (I was worried that if I pushed it in too hard during the heat of a game, it might break a ball or two and a quick look through the manual also voiced that concern so be careful!) The clip has a magnet at the bottom that pushes the magazine out of the gun quickly (think trigger magnets here) which is a good addition. Again, in the interest of fairness, on the negative side, the only issue I have here is that the clip only holds 9 shots. I haven’t done any research, but I believe that the 9 shot capacity is the only magazine available for the gun? However, I do believe that extra magazines can be purchased so if you don’t mind going that route, then it’s no problem. I put in one of the 12 grams in and dry fired it to see how many shots it would get (as everyone knows, this won’t give an accurate count but it should be a bit lower than what you would normally get.) WOW! 64 shots off a single cartridge. Now, given that maybe 8-10 of those shots will be lower velocity due to pressure change at the end, that’s still a heck of a lot of shots! Guess Kingman’s claim that it can get 70 shots a cartridge is pretty accurate. Nice going Kingman! I can’t get that much with my Phantom! The first shot was pretty good – hit relatively close to where I was aiming from about 50 feet away. The paint flew pretty true – no curves, dips or flyaways as I expected from a gun possibly shooting hot. According to the manual, it has an range of 120 feet and an effective range of 60 - plenty of distance in this puppy! 50 feet was a decent enough test. Two things I noticed right away – the sound and the kick. ZERO kick. I mean, as in none. Guess that is to be expected with a small caliber marker like this. Then, the sound signature on this thing is QUIET. You could easily keep concealed with this. Perfect for playing indoors somewhere and even better outside. So add a couple points here! The real problems came on the second and third shots. The paint just blew up in the barrel of the gun. Diagnosing this, I figure it could be any one of three things. 1. I’m shooting very hot (haven’t chrono’d, remember? ); 2. The paint is just too old or too brittle; or 3. The detents are breaking it. I also thought that maybe it just hasn’t had time to break in yet. In all actuality, it could be anything at the moment. So, I shot through the clip to see if the barrel would clear itself. To a point, I believe it did a little. A couple of the next few shots were pretty true, but the rest just did the dancing thing paint does. So, I pulled the bolt, ran the squeegee through it and dropped the clip for the next one. This brought up the next issue I have. There was actually paint on the clip itself. Just like when you chop paint in a regular marker and loader, the broken paint had worked itself into the “loader” of this gun. Not all the way down, but far enough to make it a concern of mine. Since, according the manual, you basically have to tear the gun down to clean it that far, that would be a problem in the field. Now, I’m not sure a regular swab squeegee pushed up the clip would actually fit, so maybe that’s something that could be invented in the near future? Something to at least get most of the paint out of there so you can continue to play would be nice. Anyway, I cleaned the mess up, then went out to shoot again. Same issue. This gun is a FAST gun, but the clip just doesn’t feed fast enough to shoot fast. Eventually, I’ll chrono it and see if it’s the speed, but I hope that’s the only thing wrong with it! Overall impressions: I like this thing. It’s fun! Since I don’t play paintball/tournaments anymore, I could see putting on the woodland camo again and going out to play some with this strapped on in a scenario type game. More testing needs to be done, but overall, it’s not that bad of a gun. Ratings based on a 1-5 scale, 1 being horrible, 5 being the best ever. Final comments - this is a cool little marker. Would I use it play a game with? Sure! A tournament? If everyone else were using pistols, you bet. Or just plinking around in the yard, for sure. However, with the amount of paint in the balls, I doubt it would stay fair for long as the size prohibits noticing any hits possibly. Definitely want to give it a go - I play (or rather, played) pump at the end of my "career" so I don't see using one of these as a hindrance. I found the grip to be quite comfortable, comparable to a standard .45 1911 frame from Springfield Armory. Just wide enough to get a solid grip on for offhand shooting, but not so wide as to throw off my grip entirely. Try taking off the rubber grips, and see if it fits better. If so, get some lexan grips from SPD or the like. If you're feeling a bit adventurous, I suppose you could get a bit of plexi and make your own clear/dyed ones. .43 cal balls are about $15 for 500, sometimes you can find them for cheaper. Based on the quality of the paint, I think they're equivocal to standard paint pricing (based on $60/case for the good stuff). Ok, I'll give the grip thing a shot. I have some that were made for me a while back. That's also good news with the paintball thing. I'll have to look into it, but really, shooting just 9 balls at a time, this little jar of 100 would last a few games, I think. Dark - I remember that most of the older style Spyders used timmy style detents, too. I really hated the one on my old school Sonix - it was just too stiff and only came with it on one side. But my wife's old school Victor had the ball detents so that was better. It definitely could be that the spring in the magazine is too stiff. I'm going to cut a rung or two off mine after seeing if compressing it for a week doesn't work. Thanks! No, I actually didn't check the paint to bore relationship. (I chalk that up to years of inactivity, lol!) Good idea though. I need to do that. I also wondered about the clip spring - it was hard to push down with just my thumbnail for a few times. Yes, I did actually get the microfiber. I used it, but neglected to put it in the review. I'll fix that now. I agree, cutting springs always made me a little nervous, too. I'll just load mine and leave it that way for a while and see if that helps also.